1) My mango ginger sorbet! I only make it once a year – when the ataulfo mangoes are in season and the prices aren’t too exorbitant. I was lucky to stumble upon a heaving bag of mangoes in the ‘discount produce’ section of a local market. Out of the 8 mangoes that filled the bag – only 3 were deemed unfit (almost liquefied under the skin). The other 5 were perfect…for sorbet! The fruit had reached and almost surpassed optimal ripeness and the near-fermentation of the flesh actually enhances the flavour. I have to say, that although I was lucky to find such a great deal – I will be looking for fruit in a similar fashion (to make sorbet) in the future! That bag cost me $1.50. An unbelievable steal when those mangoes can be found for $1.50 PER! Anyway – the sorbet is a classic recipe – 2.5 cups of puree mixed with 1.25 cups of ginger syrup (equal parts water + sugar and 4-5 slices of ginger). It really is the ripeness of the fruit that makes a difference. I wanted to kick things up a notch and add a coconut swirl to the ice cream. But how? What would it look like? Coconut milk? A coconut reduction? I feared that straight coconut milk would only freeze solid and wouldn’t be very palatable. As I did my weekly swim, I pondered this conundrum and it came to me…swirl with a coconut ice cream! Yes! 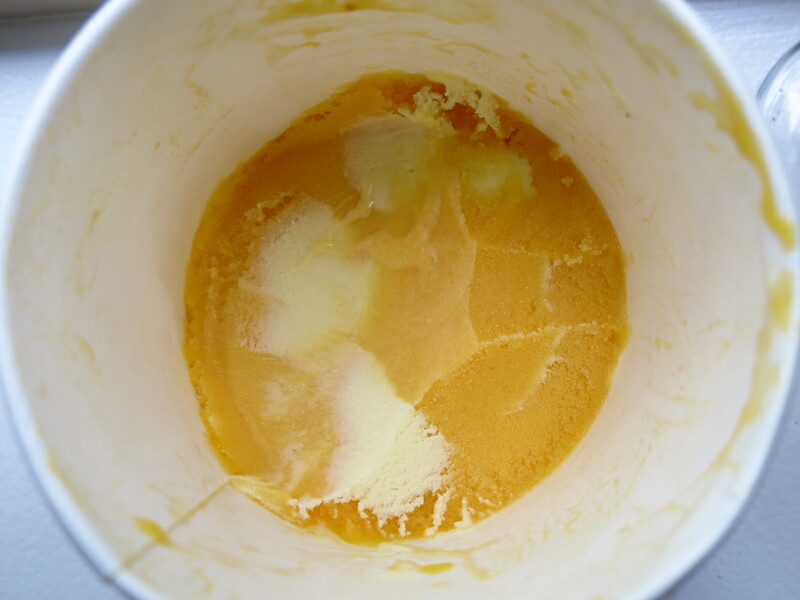 One of my baking heroes – David Lebovitz actually did the opposite – a coconut ice cream with a mango swirl (I think). 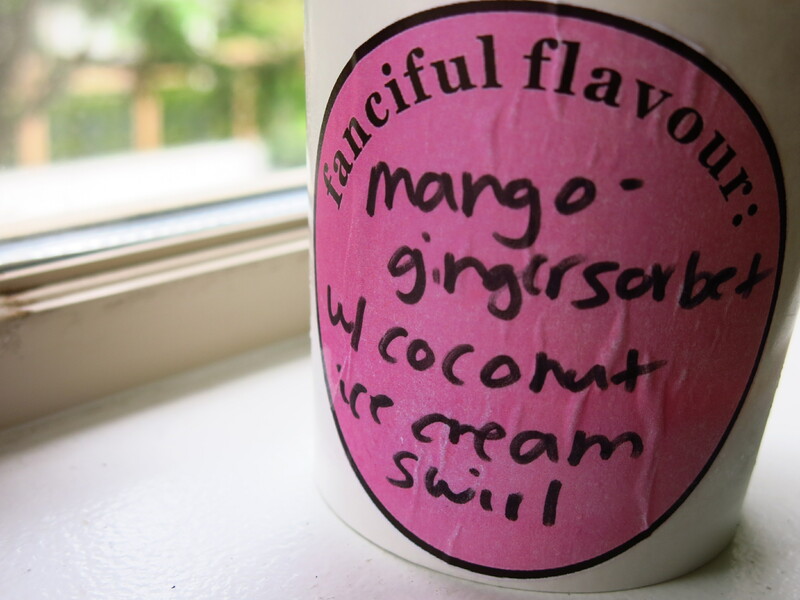 But I wound up using his recipe for a quick coconut ice cream – you can find it here. So here’s the tricky thing – making two frozen desserts…but keeping one soft enough to swirl into another! Tricky…tricky… As the coconut ice cream would be swirled INTO the sorbet, the sorbet would have to be softer. So the ice cream was processed first and the sorbet second – with it being more maleable. How did it go? My swirling needs some work. The first batch came out more as “coconut ice cream chunks” and I found my swirling mojo after – with the trick of it being to do thin layers. I think next time I will also try folding it in the machine. Ta da! It was still damn tasty. -Become stronger: I started lifting weights. The attendant at my gym was super helpful and started me with 6 basic moves – lifting heavy, short reps.
-Cut sugar: No treats, no cookies, no candy, no chocolate, no juice (not that I drank a lot of it…but cocktails! )…and no fruit. -Minimal carbs: Dramatically limiting bread, pasta, and white rice. Hellooooo quinoa. I’ve never felt better – (although I am currently recovering from a respiratory infection, haha) I feel strong, I feel more energized and yeah…. it’s working. It also helped that I had a vacation to Vegas booked and wanted to look my best. I am in the best physical shape I have ever been in my adult life and the smallest I have been, in terms of clothing size. My aim was never to lose weight and for a while, on the scale – it said I had only lost 1lb, but it looked like I had dropped 5. My arms have never looked better and I’m absolutely killing the hills on my bike training. Even after Vegas – I’m continuing on. I miss sugar. I really do – but I don’t miss the energy crashes and now even smelling a cookie gives me enough sugar. For now. As a result – my baking has been pretty much curtailed. Rich, hearty meals? Gone. I’m actually doing a lot of gluten-free, sugar-reduced baking. It’s definitely not what I thought I’d be posting – but I’ve been pretty impressed with the results.